Rich currently has an HO layout but is planning to build an S scale one as well. Rich's father was also a model train buff and Rich recently inherited his father's collections. In this collection, Rich has Standard, O, O-27, S, HO, N & Z. He had to build a train room to house his collections and his HO model railroad. Wally is a co-founder of the North East S Gaugers which has grown from a regional club into the National Association of S Gaugers (NASG). He has provided guidance for the NASG in legal matters over the years and has the honor of being the first NASG Bernie Thomas Award winner. He also published the S Gauge Herald in the 1960s and 1970s. Wally's steam only Midland Pacific had about 500' of code 100 S scale hand-laid track and over 50 Del Aire driven turnouts, mostly crafted by Earl Eshleman. Changed to S Scale when he realized that HO just wasn't doing it for him. John expends a lot of time and energy promoting S scale by manning the NASG booth at area train shows. His devotion to S scale was recognized by the NASG when he was named the 2004 Bernie Thomas Award winner. 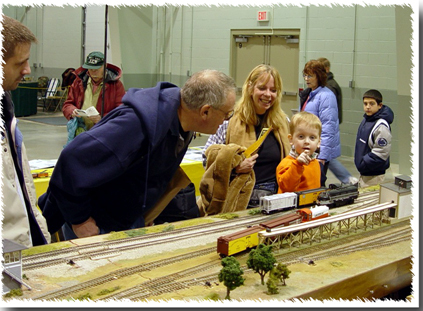 If you see the NASG booth or switching layout at a train show in the Northeast, most likely John is there sometimes accompanied by his grandson Colin. Bill's S scale railroad is the Jefferson Central. He hosts the annual Jefferson Central Favorite S Scale Model Contest. His pike has been featured in several model railroad magazines and is open for guests year around. Just call first. Bill is also a camera buff and you may have seen some of his photos and articles in model railroad magazines. He is also one of our more prolific modelers. A member of the NASG, NMRA, MER and the MER Susquehanna Division, he has earned the NMRA Model Railroad Author Achievement Award and his Pike has won the NMRA - MER Golden Spike Award. Dave is a die-hard narrow gauger. He writes the narrow gauge column, The "S"traight and Narrow, in the NASG Dispatch. Dave is working on a new S/Sn3/Sn2 layout with DCC control and sound. Roy, retired from Conrail, is a former president of the National Association of S Gaugers (NASG). His S scale Penn Western layout, dedicated to Pennsylvania railroads, both standard and narrow gauges, was featured in the July/August 1998 S Gaugian. A skilled artist, Roy uses this talent to great effect on his railroad. Matt has been involved with S scale trains for some time and has an extensive collection of equipment in both S and Sn3. He is also active in the Friends of the East Broad Top. Marty is a Flyer collector and also has a large collection of Plasticville buildings. His goal is to build a layout typical of the kind hobby shops and model railroaders had in the 1950s. Bert is actively working on a double deck S scale layout based on the early years of Conrail. Bert likes railroad operations. Before he moved up to S scale, he had a completed HO layout with an operating CTC panel. He uses DCC control on his S scale layout. Tom models in S when he is not out working on his farm. Barry is working on a new layout. His former S scale layout was based on the Pennsylvania Railroad with an "almost" horseshoe curve and a branch line. It featured a huge passenger station and long consists of hopper cars. Barry is one of the more active club members who is always working on his layout. Jerry, who comes from a long line of S gaugers, is one of our newer members and his interest is in Sn3. He also enjoys woodworking so we know his bench work will be top notch. I started in S Scale when I received an American Flyer train set up in 1949 when I was five years old. A NYC Hudson 324AC, Talking station, Sam the semaphore man, log unloader, automated baggage car, cow and car loader, etc. I and my brother played with this until 1960 when dad bought us another set. A UP northern 336 set. More trains!! We ran these until 1965 when I switched to HO. In 2006 at the NMRA National convention, S Helper service had a large booth showing off S scale cars, track, and locos like I NEVER saw right off the shelf. They were selling cars two for the price of one. I came home with two cars. That was it, I was hooked! Back to S for me, but this time I'm going Scale! Mike is an American Flyer fan. When he is not displaying his AF circus train at an area circus modeling meets and displays, he volunteers at Steamtown in Scranton and at the Railroad Museum of Pennsylvania at Strasburg. Steve, a former HO modeler, is interested in S scale and is a big Sante Fe fan. He sometimes can be found in the Del-Aire booth at train shows helping his son Gregg. Frank Titman is very well known in the S scale community and is the only two-time NASG Bernie Thomas Award winner. He is the co-founder of the North East S Gaugers, the Delaware Valley S Gaugers, and also the Lehigh Valley S Gaugers. He was the editor of the S Gauge Herald in the 1960's and 1970's and is the former owner of Lehigh Valley Models. He has authored many product reviews and articles on converting HO and O scale buildings to S scale that have appeared in the S Gaugian. A master craftsman, he has built many steam locomotives, no diesels -- don't even suggest it to him! -- and many of the structures on his Spiral Hill layout that was featured in Kalmbach's Great Model Railroads of 2000 and also on the PBS television series Tracks Ahead. Stan was a former Flyer guy who joined the ranks of the scale modelers. As a native of the Philly suburbs right on the old B&O Philadelphia subdivision (now CSXT), his main interest was in modeling the Chessie/B&O era of the late 70s. He enjoyed building freight car kits and was in the planning stages of a layout. He was a major contributor to the NASG as Web Master and Membership Secretary. Fred owns S Scale Loco & Supply and has recently moved from Pennsylvania to Florida.